At work in the aftermath of the Halloween snow storm, one of my colleagues brought in his son because school was closed. I joined a math discussion between the boy and my boss Steve Heller on the subject of ways to think about products of the form (x + a) (x – a). Afterwards, Steve happened to mention that it was possible to inscribe a tetrahedron inside a cube, and a cube inside a dodecahedron. The dodecahedron sounds difficult, but I decided to build a tetrahedron inside a cube. 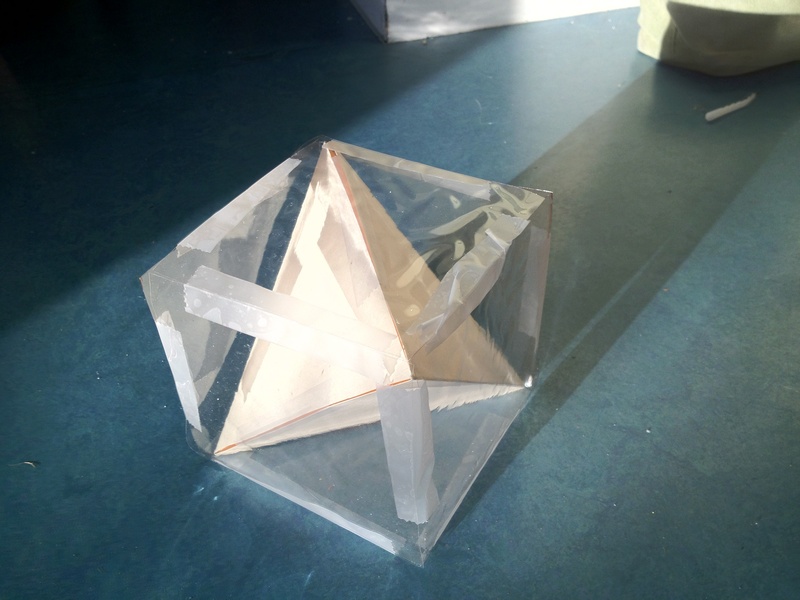 The tetrahedron is cut out of a manilla folder, and the cube is made from a sheet protector. Thursday night, my daughter and I went with my neighbor to the same store to look at Black Friday doorbusters. The newspaper ad said they would open at midnight. They were closed. The line wrapped halfway around the building. Eventually some workers came down the line handing out maps. They said that Massachusetts law wouldn’t let them open at midnight, so they would open at 1AM. By this time it was around 33 degrees, and still 45 minutes to wait. We went home. I looked into this question of law, and found an article dated about 10 days ago which said that Massachusetts Blue Laws forbid employees from working before midnight on Thanksgiving, in order to let them have a holiday. So evidently, staff could report at midnight, but it took them an hour to unlock the doors. I think this is one of those situations in which Target, at least this store, doesn’t get it. They seem honestly puzzled that the public might expect them to be open when their ads say, and expect that staff give correct information about hours, or that anyone might not be grateful for the chance to stand around in freezing weather for an hour in the middle of the night in order to come into their store. So why do I say “mixed”? Because I was gullible enough to go back at 6:30AM Friday to the same store that locked me out twice in two days. And you know? They did a really good job. All the workers were there. Everyone seemed to know where everything in the store was located. They had adequate stock. They were friendly. I should add, however, that the store was recently remodelled, turning a once open layout with long sight-lines into the sort of place where you can’t see where you are trying to get to. The interior is now about halfway between reasonable and Walmart.